Nature and history of gold; Geology of gold ore deposits; Gold deposition in the weathering environment; Sedimentation and detrital gold; Gold exploration; Lateritic and alluvial gold sampling; Mine planning and practice; Metallurgical process and design; Evaluation, risk and feasibility; Appendices: Field laboratories and techniques, Short-note – Variogram structural analysis, Sitework testing, Gold economics. 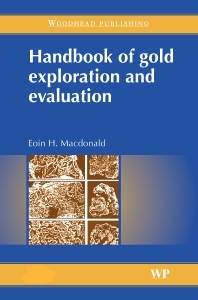 Designed for geologists and engineers engaged specifically in the search for gold deposits of all types and as a reference for academics in higher schools of learning, Handbook of gold exploration and evaluation provides principles and detailed explanations that underpin the correct interpretation of day-to-day experience in the field. Problems are addressed with regard to the analysis, interpretation and understanding of the general framework within which both primary and secondary gold resources are explored, developed and exploited. Handbook of gold exploration and evaluation covers a comprehensive range of topics including the nature and history of gold, geology of gold ore deposits, gold deposition in the weathering environment, sedimentation and detrital gold, gold exploration, lateritic and placer gold sampling, mine planning and practise for shallow deposits, metallurgical processes and design, and evaluation, risk and feasibility. Eoin H. Macdonald ME, FIEAust CP Eng has an international career spanning 65 years as a consulting mining engineer and is highly regarded for his previously published work on alluvial mining technology. As Australian Special Advisor to CCOP (Committee for Co-ordination of Joint Prospecting for Mineral Resources in Asian Offshore Areas) in the ESCAP (Economic and Social Commission for Asia and the Pacific) programme of the United Nations Development Programme, he cooperated with Special Advisors from the USA, UK, France, Germany, the Netherlands, Japan, Canada and Australia in the search for and appraisal of surficial and nearshore deposits globally along the continental shelves. This resulted in a bi-annual series of international training courses on gold prospecting and evaluation with the author as Director of Studies. He has advised on alluvial gold projects associated with exploration, mining, treatment and evaluation worldwide, including Australia, New Zealand, South Korea, Papua New Guinea, and extensively throughout the Americas, Africa, the Indian sub-continent and South East Asia.